The Kampot Riverside Hotel is a centrally located hotel that overlooks the river, making for a perfect spot for sundowners. A prime slice of riverside real estate isn’t the only thing the Kampot Riverside Hotel has to offer, though sunset drinks here are not to be missed — not much beats sipping sparkling wine or dollar Cambodia drafts at the quiet riverside bar while the red sun sinks into the Kampot River. 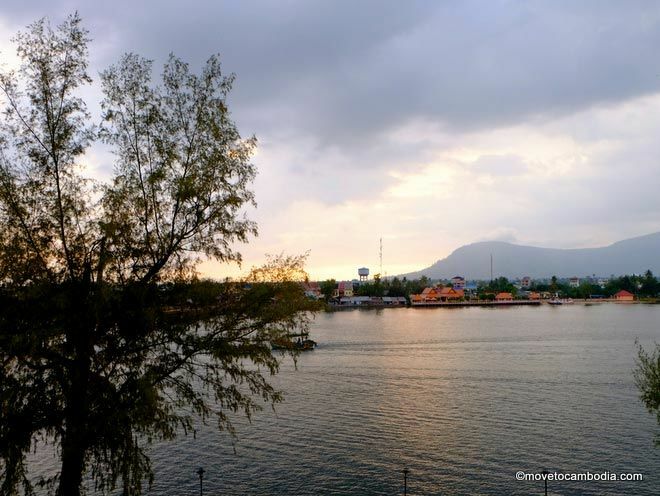 Balcony rooms at Kampot Riverside Hotel offer prime views of Kampot’s lovely river sunsets. The four room types, ranging in price from $29 for the standard to $55 for the deluxe, are spotlessly clean and spacious, if a little bland, with nice lighting, a large desk and wardrobe, bedside table, safe, mini-fridge, and tea kettle. Two bottles of water are provided daily. The bathrooms are roomy, with a semi-enclosed shower — no wet bathroom here — and plenty of shelf space for toiletries and drying towels. 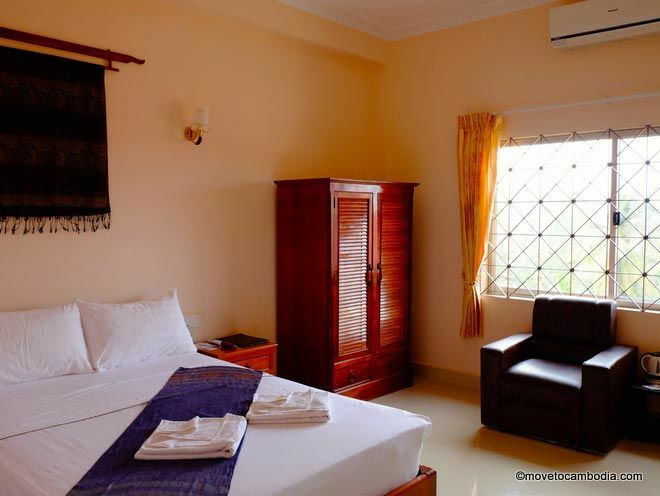 A standard Plus room at Kampot Riverside Hotel. At the higher end of the price range, you get river and mountain views and a bit of extra room. Our Standard Plus room had a side view of the river and a little seating area and side table, and the fan and air-conditioning were a relief after a hot and dusty day bicycling around the countryside.The hotel does not have a lift, so be sure to ask for a room on a lower floor if you’d rather avoid trudging up the stairs. There’s also a budget ground-floor twin room with fan only that starts at $19. Each of the hotel’s four floors has a long communal balcony facing the river — a cool breeze blows through the halls all day. Breakfast is included, and it is generous, with eggs to order, fruit salad, bacon, and baguette, with tea or a small press pot of coffee. 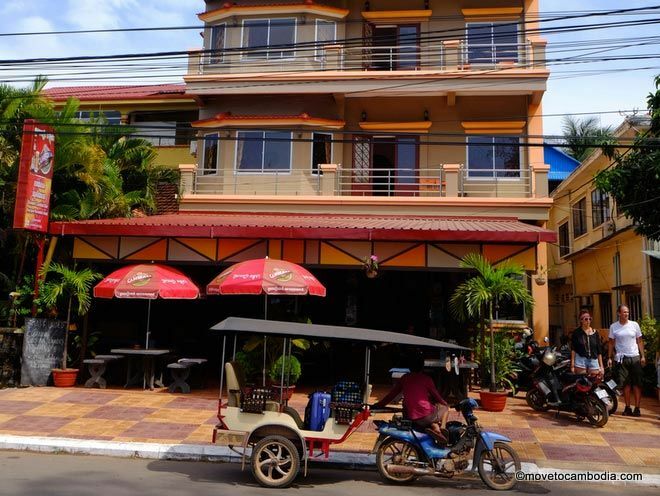 Kampot Riverside Hotel is ideally located facing the river and close to restaurants and bars. Wifi is reliable throughout the hotel and on the patio. 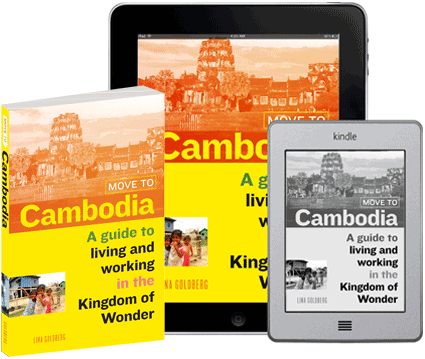 The Khmer staff are friendly and efficient, while the Australian owner, who answered our innumerable questions and helped us arrange onward travel to Kep, has a dry wit we found pretty amusing. This central riverfront location is killer, and the rooms are great value. Room prices are about the same whether you book directly or on Booking.com, but they are less expensive in low season. 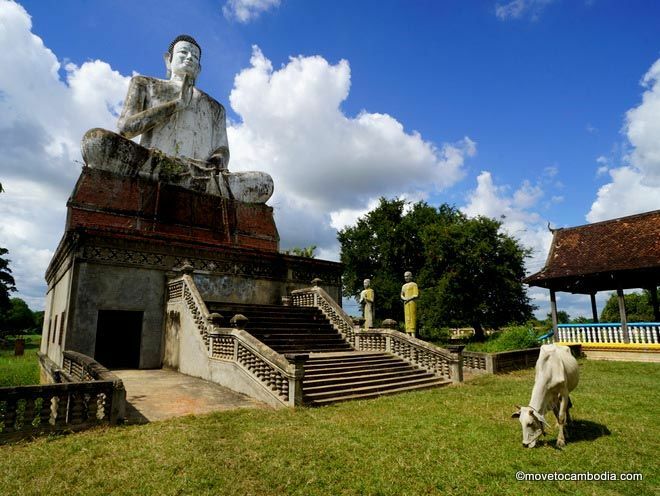 → Check prices and book a room at Kampot Riverside Hotel on Booking.com now.